Both cephalic and caudal zone of the adenophypophysis contain cords of acidophils and basophils and clusters of chromophobes. In the cephalic zone however, the cell cords are more closely packed and only pale acidophilic cells are present. 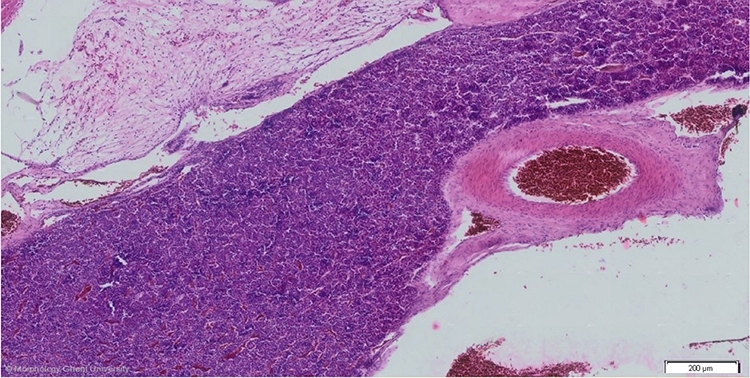 In contrast, the cords in the caudal zone are separated by a more loosely-arranged connective tissue and especially more deeply-stained acidophils are present. This causes a more basophilic appearance of the cephalic zone and a more acidophilic appearance of the caudal zone.